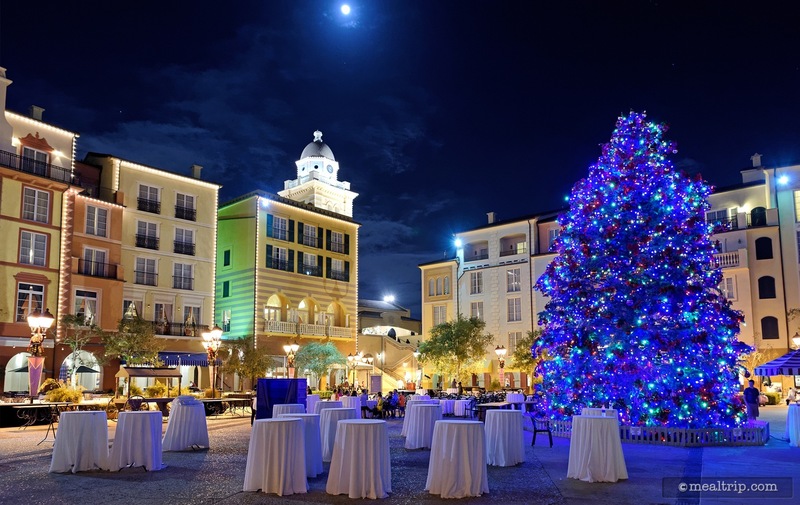 The Holiday Harbor Nights listing is a Special Event dining location at Loews Portofino Bay Hotel featuring Italian, American, Wine, Beer, Spirits or Beverage-based cuisine. There are 41 photos in the Mealtrip photo gallery for this location and dining period. 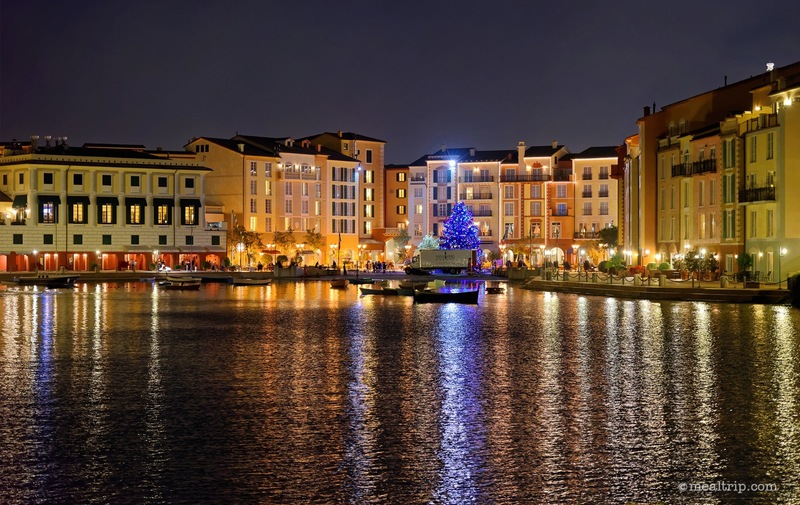 The Holiday Harbor Nights listing currently has a score of 40 out of 100. 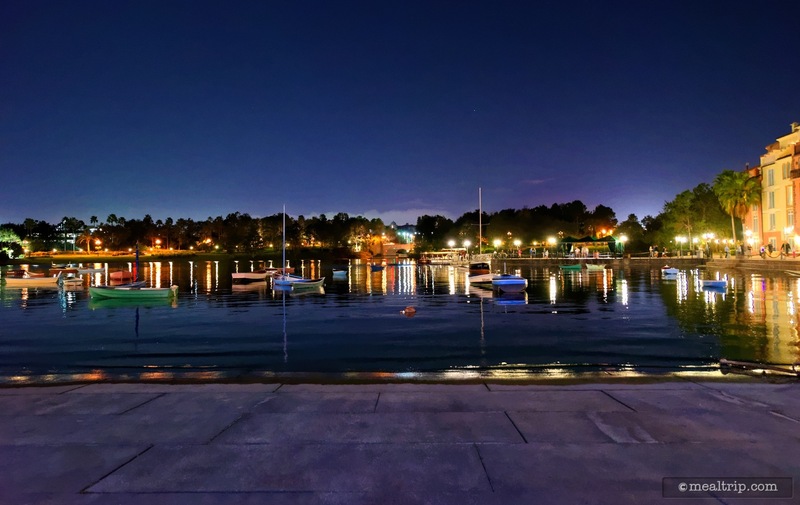 Click here to read all of the reviews for this location, or log in to Mealtrip.com to add your own review for Holiday Harbor Nights. 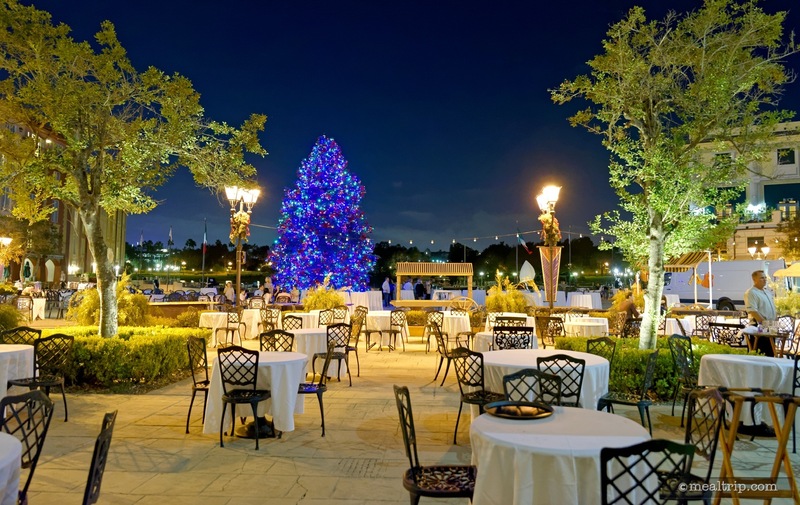 The VIP Seating area at Holiday Harbor Nights is quite large (and probably scalable). 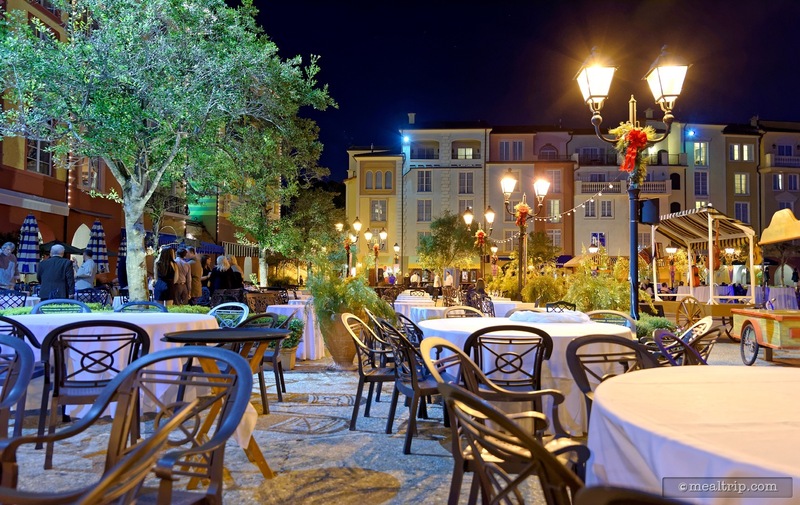 While there it may seem spacious without people, there are a few tables that we feel are too close together. 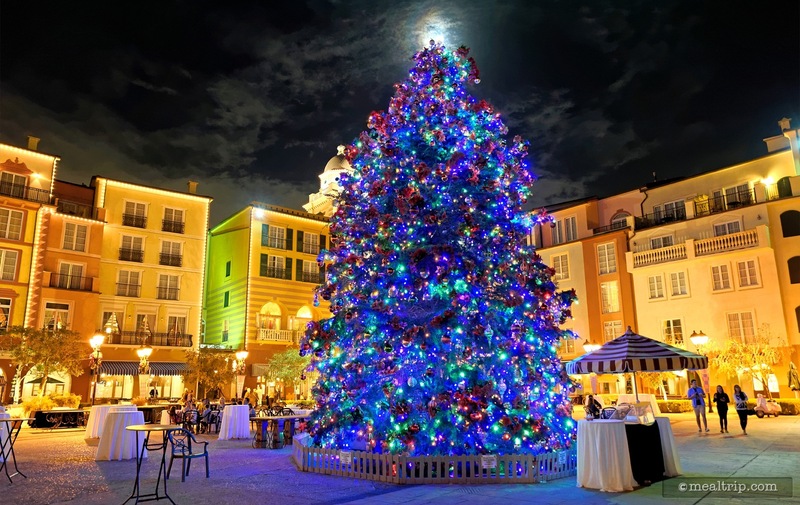 There are many standing tables located around the holiday tree centerpiece. These are non-reserved and are available to everyone. 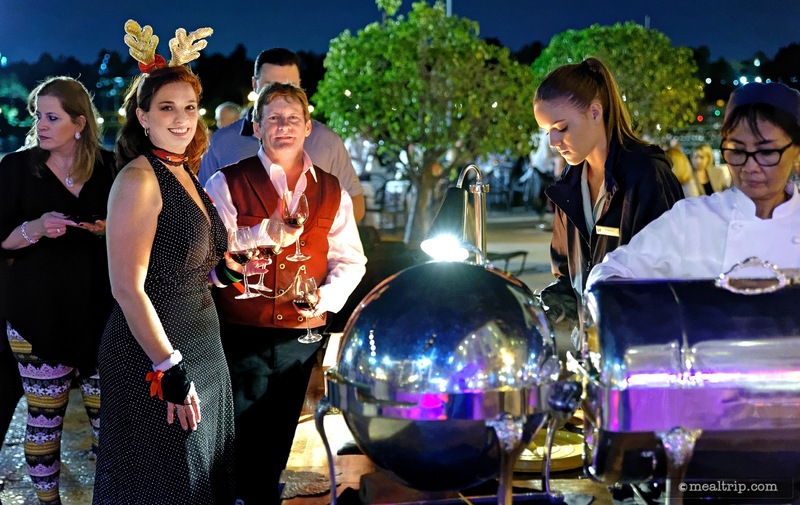 Many guests use the tables to place their drinks and plates on, and then move on to the next food or beverage station. 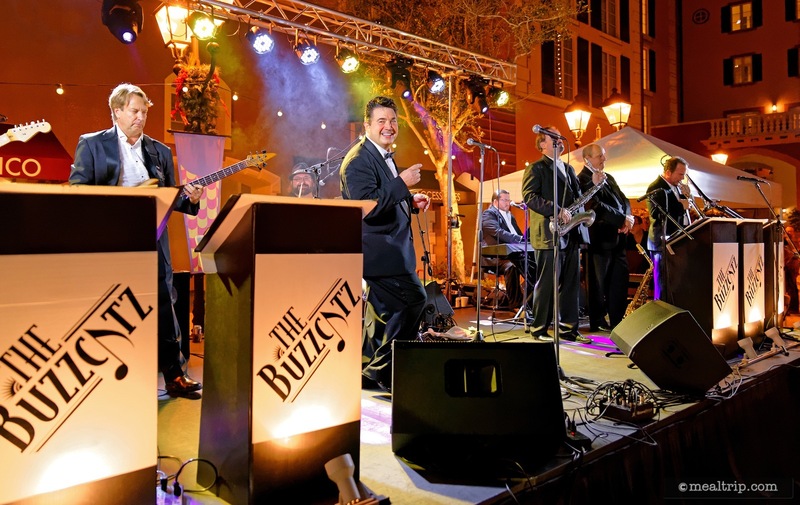 Event and wedding band "The Buzzcatz" were on hand at the 2015 Holiday Harbor Nights event. 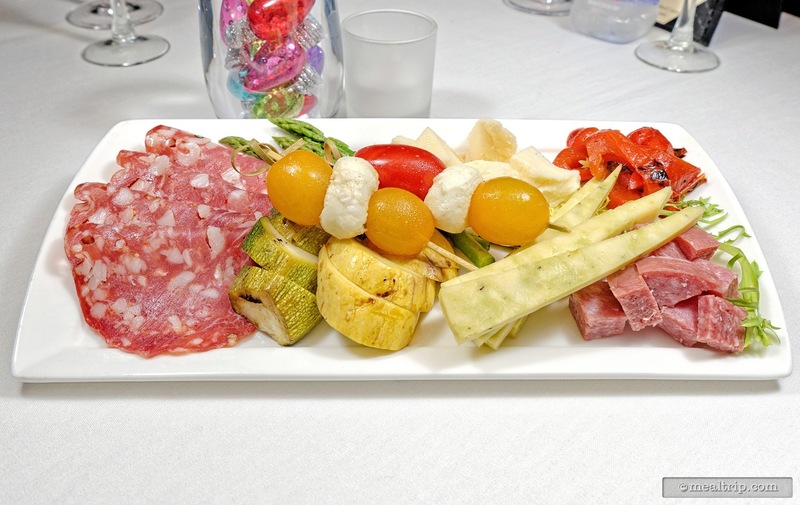 The Antipasto plate is brought out to only the VIP seating guests and featured two meats, three cheeses, and several vegetables, including a couple stalks of grilled asparagus. 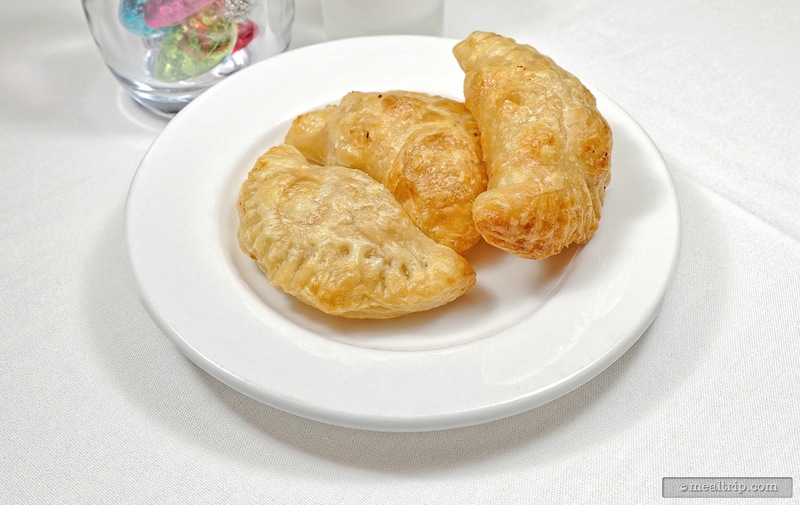 These Chicken Puffs are just one of four hot "appetizers" that are delivered table-side to the VIP seating guests only. 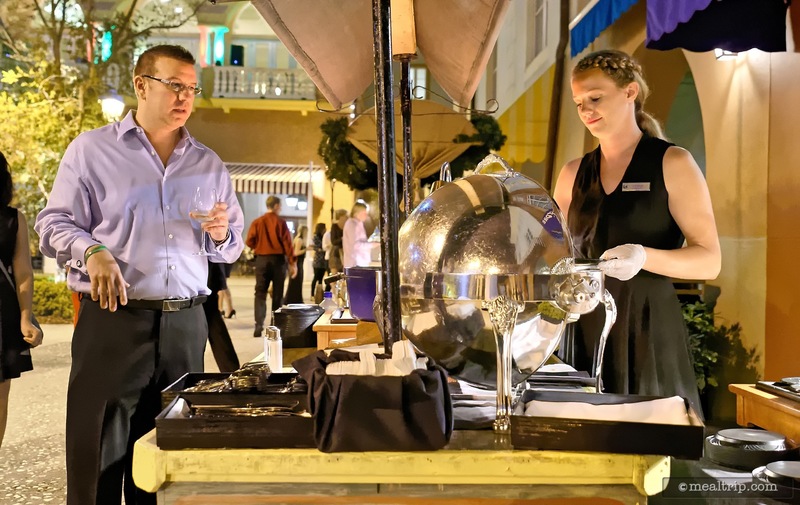 The festive Santaquila Sunrise was the featured cocktail at 2015's Holiday Harbor Nights. 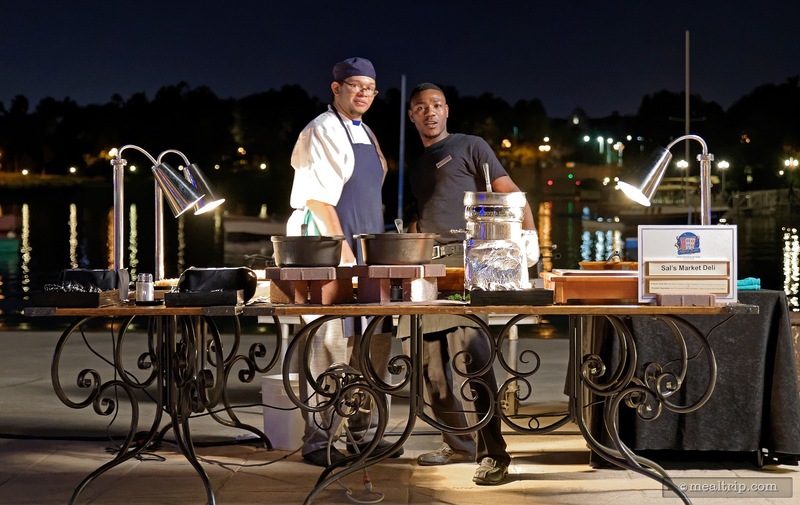 Mama Della’s Ristorante presented a Sautéed Mahi-mahi with Orecchiette Pasta, Roasted Fennel Cream, Sugar Peas and Crispy Garlic at the 2015 Holiday Harbor Nights. 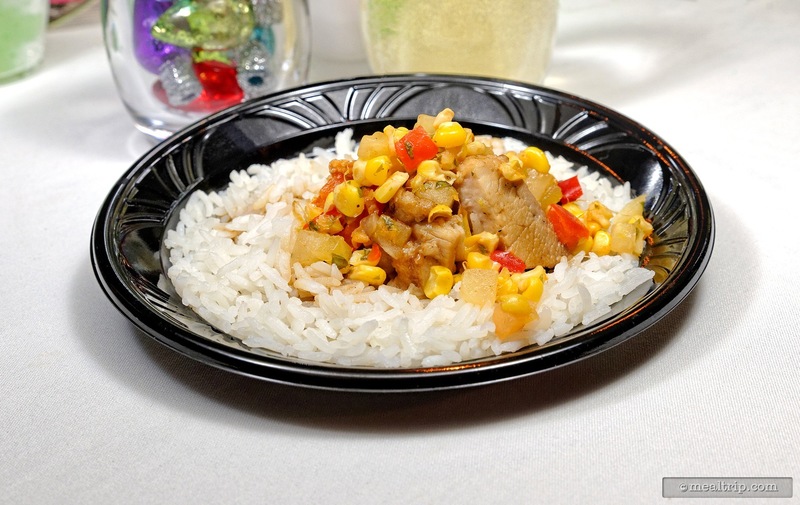 Trattoria del Porto® presented a Braised Pork Belly with Five Spice and Cardamom, Steamed Lemon Grass Coconut Rice at the 2015 Holiday Harbor Nights. 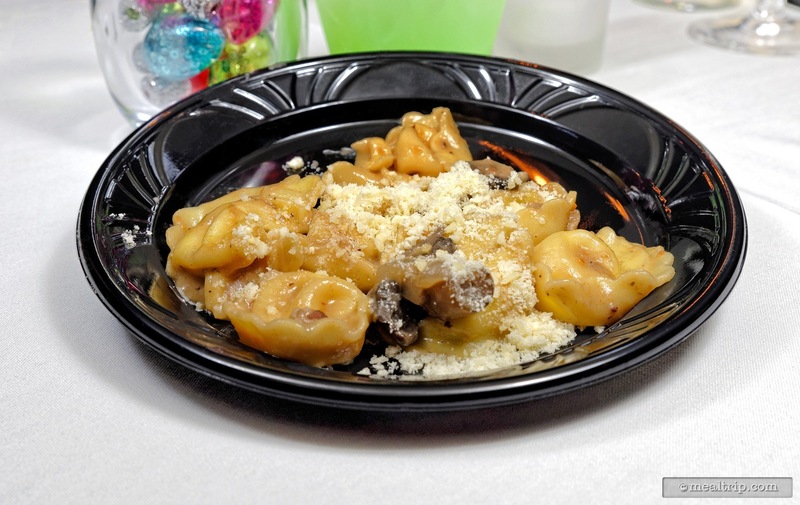 BiCE Ristorante offered a Four Cheese Tortellini, Veal Demi-Glace Herbed Cream Sauce, Mix Mushrooms, Prosciutto and Green Peas at the 2015 Holiday Harbor Nights. 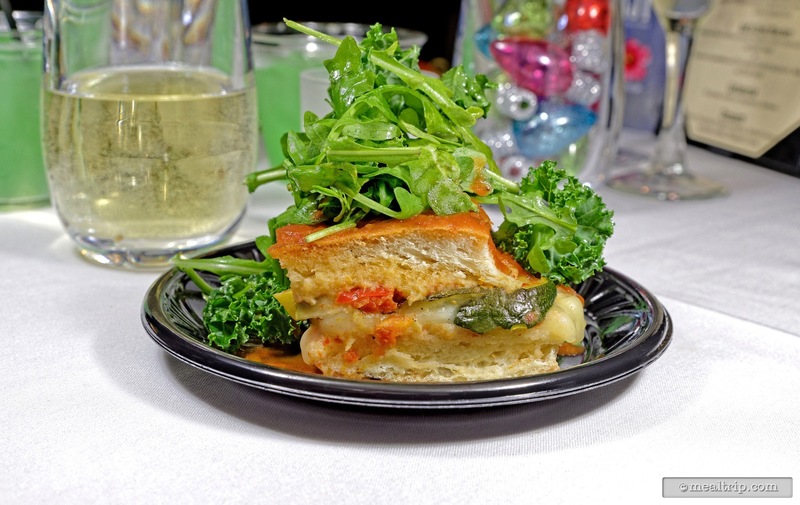 Pictured here is the Slow Braised Chicken Rollatini with Spinach, Mushroom, Ricotta Cheese and Artichoke Mirepoix and White Wine Sauce, Top with Olive Gremolata that Splendido was preparing at the 2015 Holiday Harbor Nights. Sal’s Market Deli was making two sandwiches, the Grilled Vegitable with Provolone is pictured here. 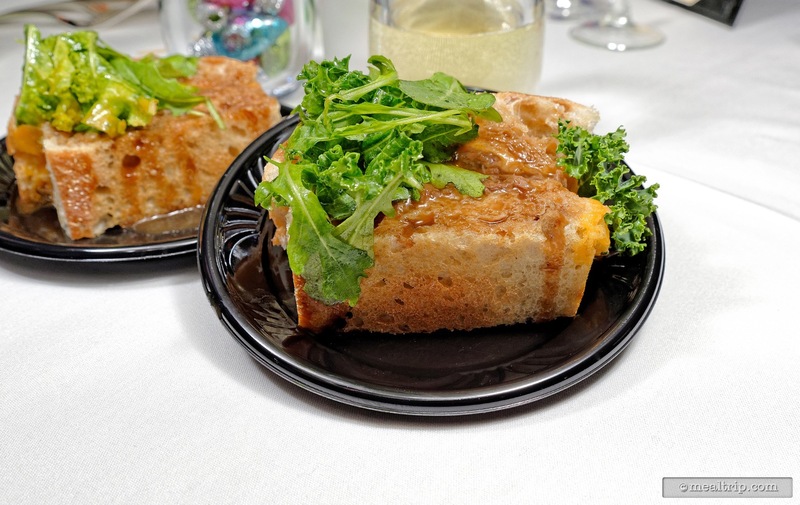 Sal’s Market Deli offered two sandwiches, pictured here is the Braised Short Rib and Aged Cheddar Grilled Sandwich, with Baby Arugula and Kale Salad. 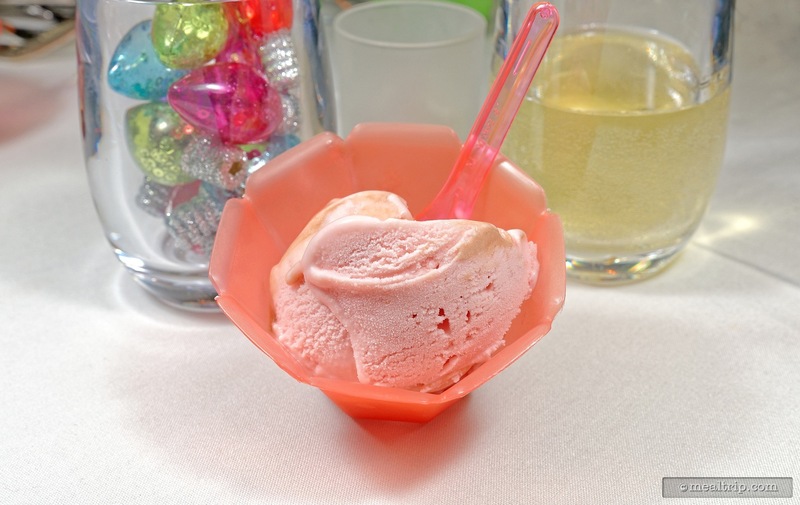 Gelateria offered two cold treats, pictured here is a Raspberry Sorbetto. 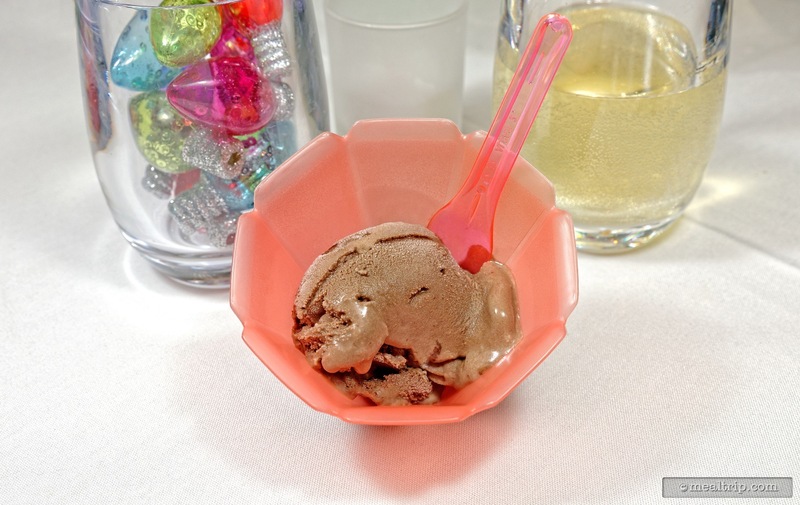 Gelateria presented their Chocolate Gelato at the 2015 Holiday Harbor Nights. 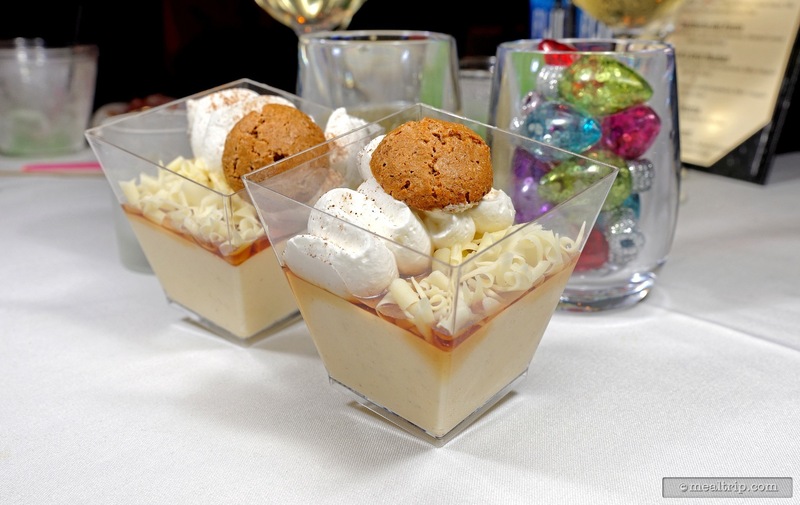 The prepared dessert at 2015's Holiday Harbor Nights was a White Chocolate Pumpkin Mousse, Salted Caramel, Amaretti Cookie, Whipped Cream. 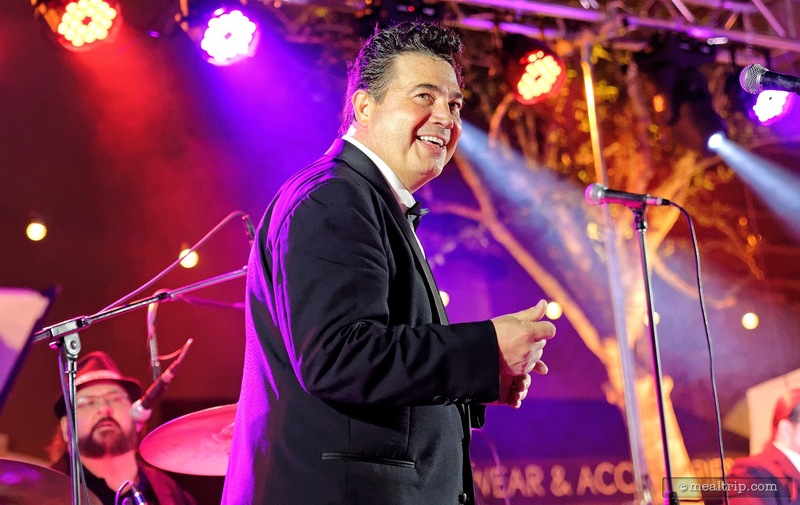 Ricky Sylvia is the front-man for "The Buzzcatz" at the 2015 Holiday Harbor Nights. Naome Bradshaw with The Buzzcatz covers Steve Perry's "Don't Stop Believin'" better than most of the Journey tribute bands I've heard. 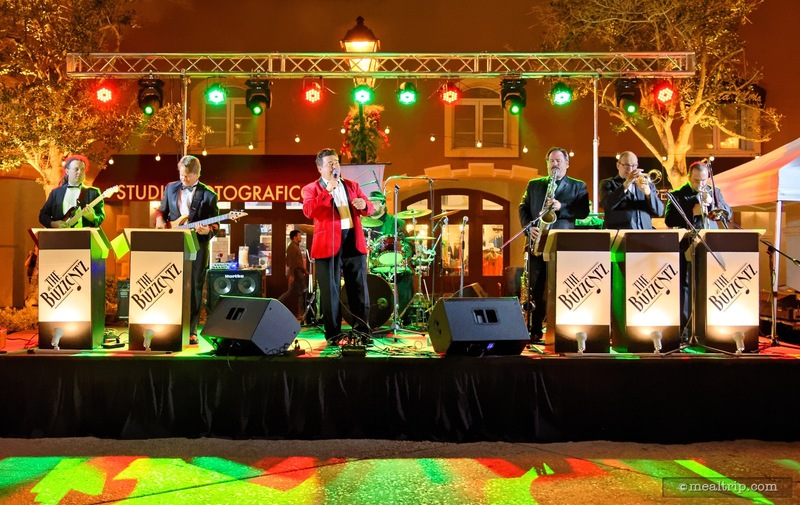 The Buzzcatz have been performing at the Portofino Bay's Holiday Harbor Nights for the past decade! 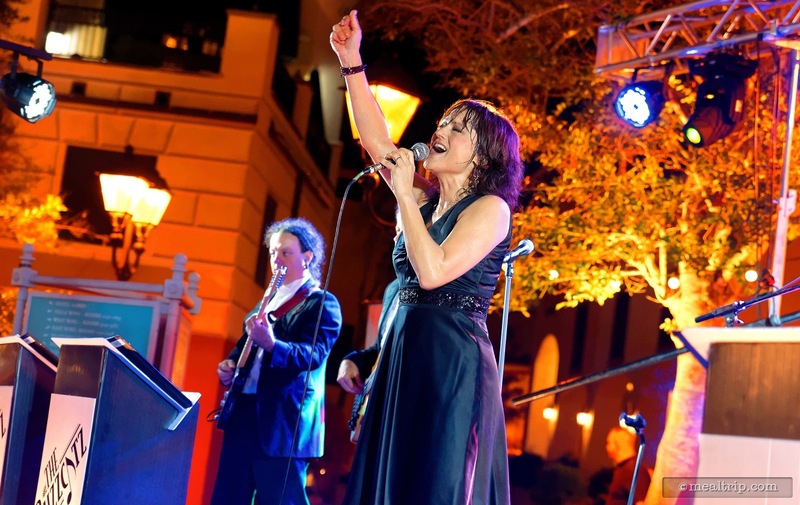 The always dynamic Naome Bradshaw performs with The Buzzcatz at the 2015 Holiday Harbor Nights at the Loews Portofino Bay Resort. 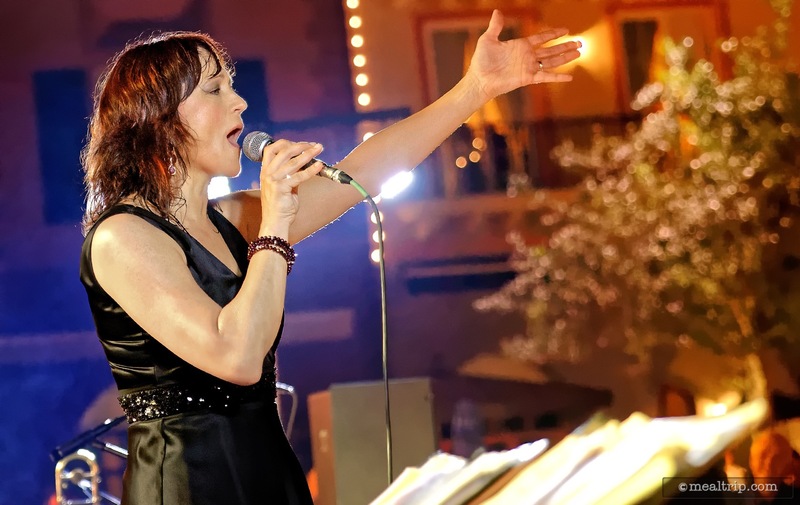 In addition to the two sets that the cover band performs, a small troupe of opera singers perform two sets as well. They perform from a balcony overlooking the main entrance for the event. There are at least four reds and four whites along with a few sparkling wines at the Harbor Night's events. 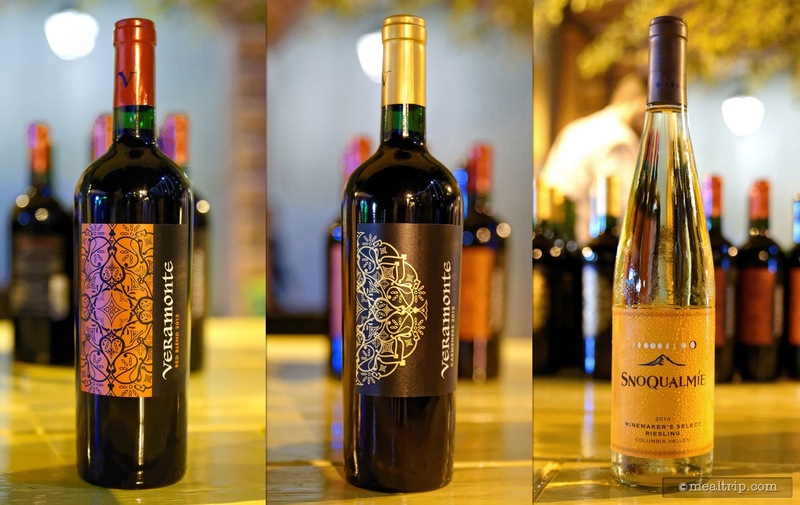 Pictured here are a Veramonte Red Blend, the Veramonte Carménère, and Snoqualmie's Select Riesling. 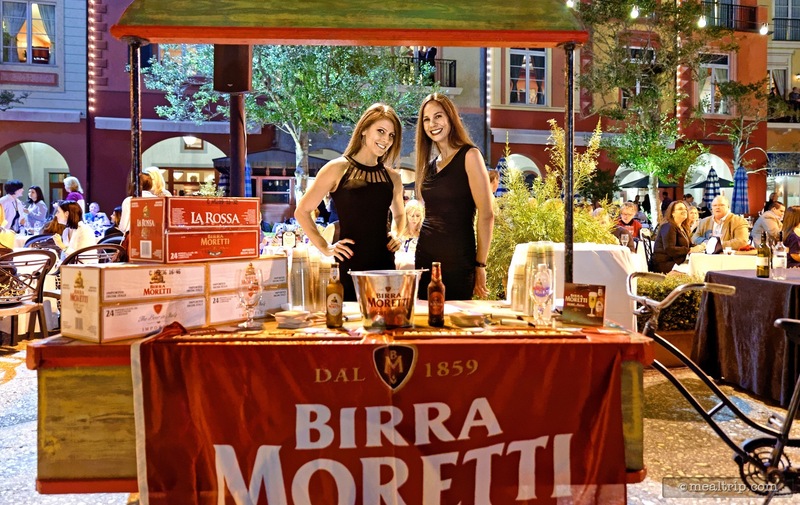 The beverage selections change at every Harbor Night's event. 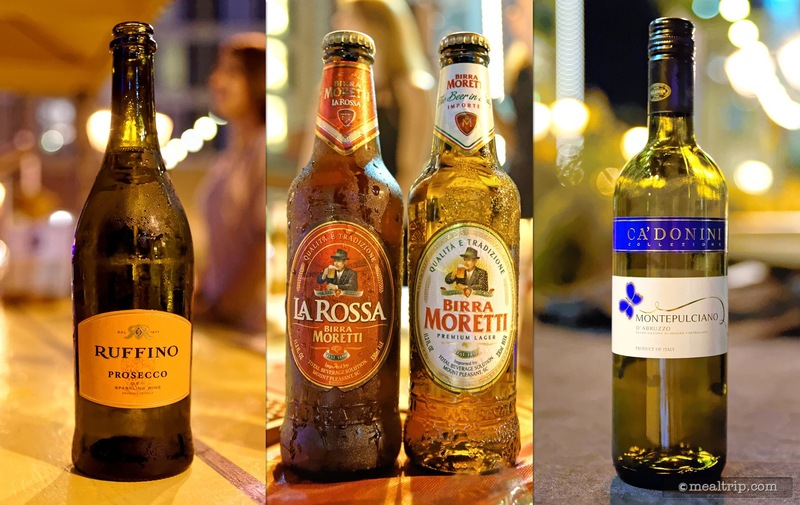 Pictured here is Ruffino's Prosecco, two beers from Moretti the LaRossa and their Lager, along with Ca'Donini's Montepulciano D'Abrozzo. 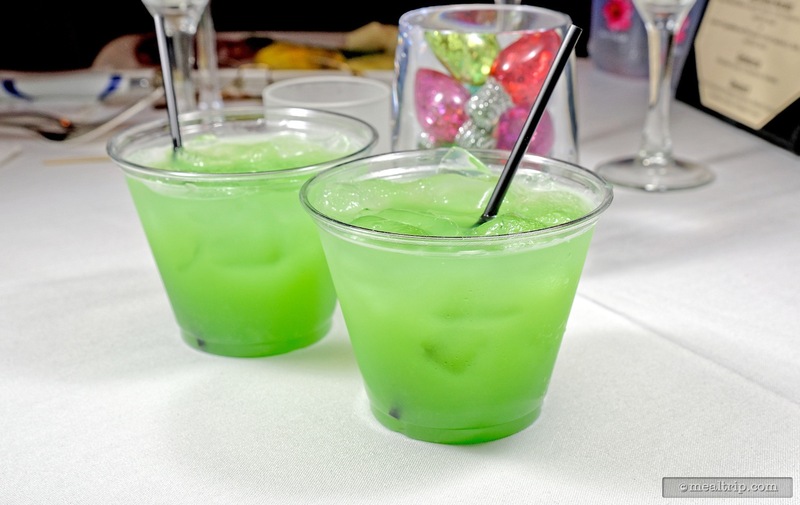 Only in Florida will you find neon green holiday cocktails! 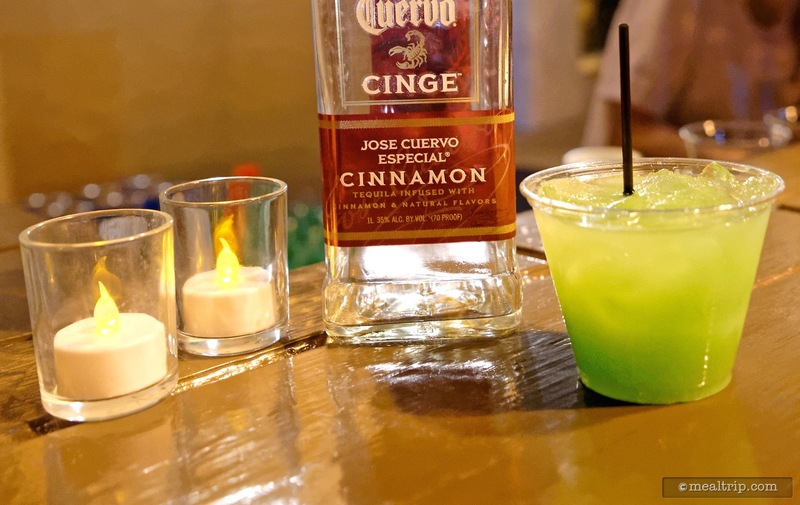 The "Santaquila" from the 2015 Holiday Harbor Nights was actually a great drink and featured Jose Cuervo Cinge (a cinnamon infused tequila), Blue Curacao, Orange Juice, and Pineapple Juice. 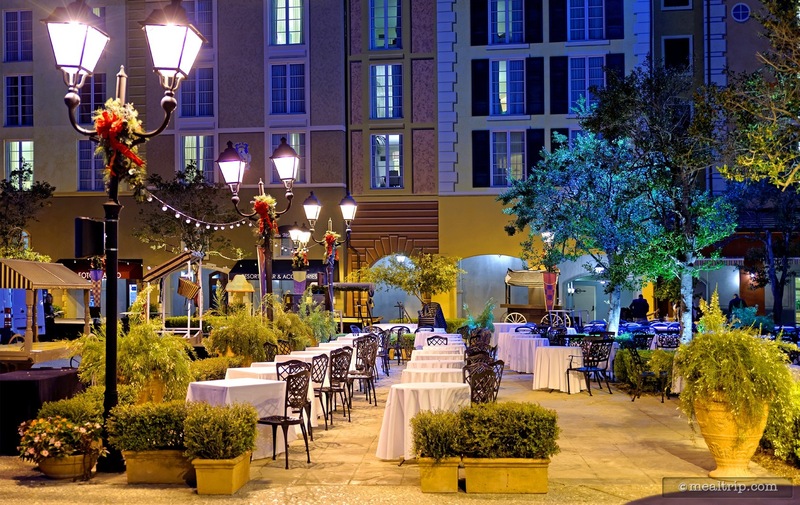 Beverage and food stations are located around the outside edges of the event space. At beer stations (pictured here), plastic cups are available, or you can use your wine glass. Some guests at the Holiday Harbor Nights got dressed up for the occasion! I especially like the "two wine glass holding" technique. I'll have to try that. 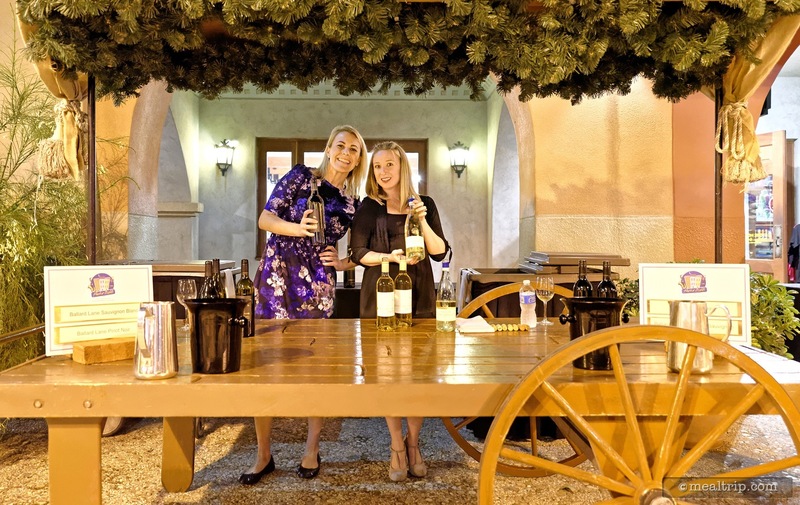 At wine stations, bottled water is available to rinse out your wine glass, if you will be sampling many different brands, blends, and varietals over the course of the event. 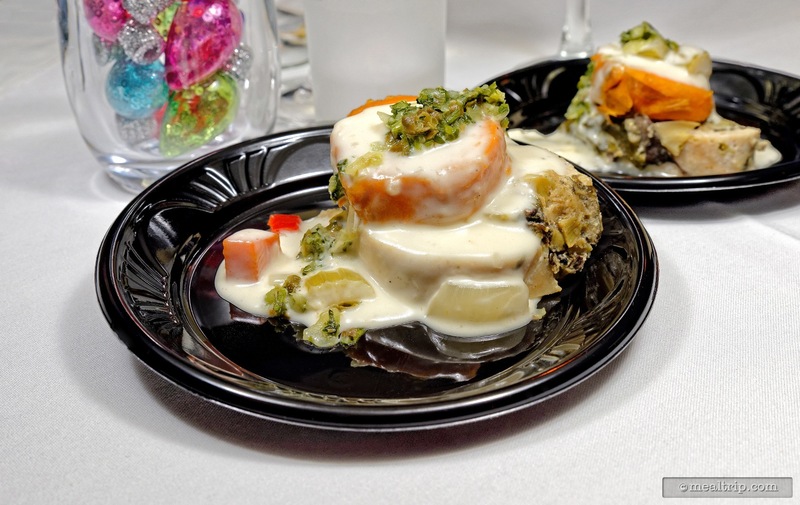 Most of the small plate food samples are made to order at the Holiday Harbor Night events. Just walk up to a food station, and cast members will plate a sample for you. 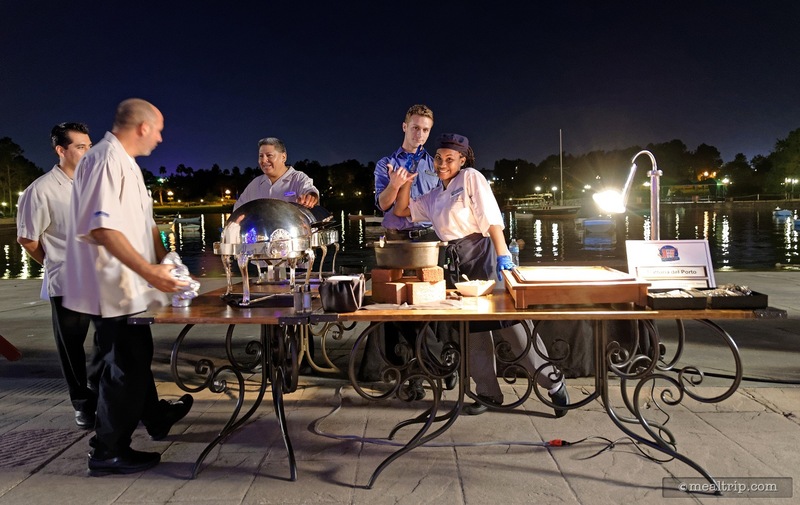 If you are new to the Harbor Night event series, you can just walk up to a food station like the one pictured here, and cast members will make a small plate sample of their dish. 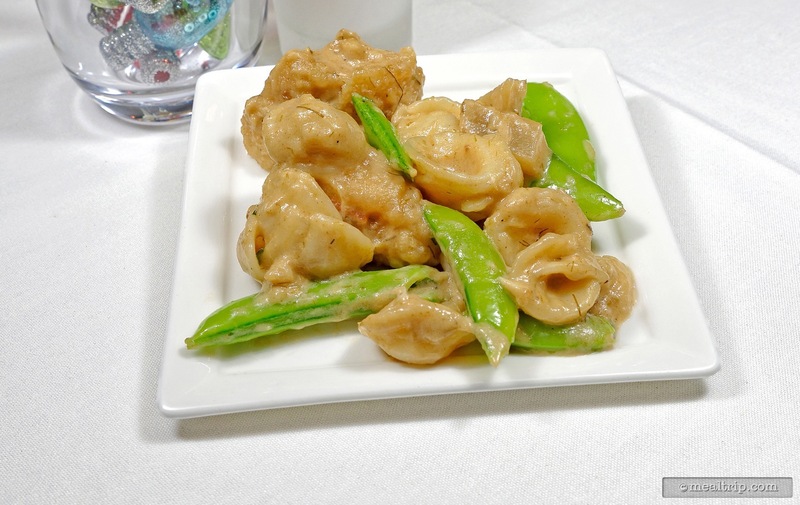 You can eat as many, or as few, as you choose over the course of the evening. 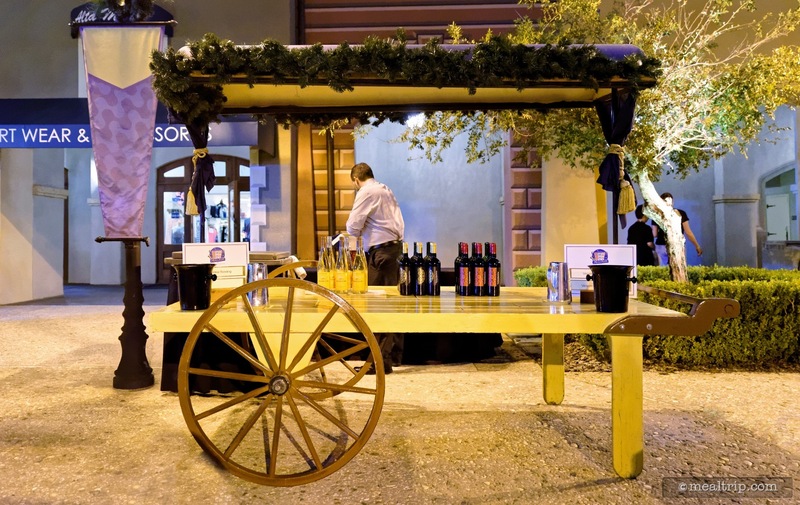 Occasionally you will find a duplicate wine cart, but because there are at least a dozen different wines to sample at each of the Harbor Night events, most carts offer a unique selection. Most of the food stations have at least one duplicate station somewhere around the piazza, to keep the lines from getting too long. 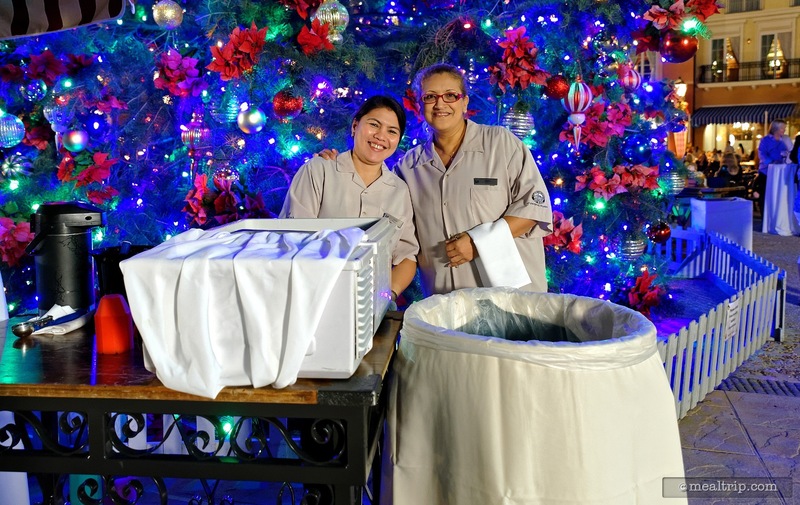 The Gelato Ladies are ready to dish out some of the Italian Ice Cream to guests. There are usually a couple flavors to choose from. 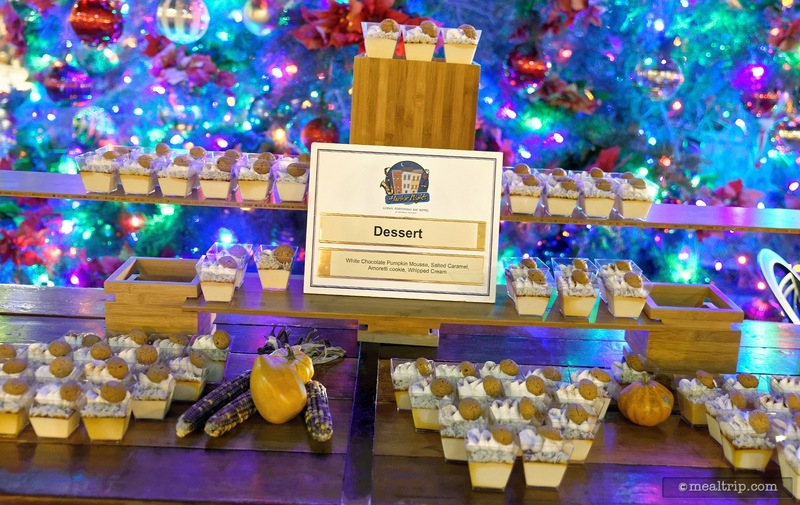 The prepared dessert station at the 2015 Holiday Harbor Nights featured a White Chocolate Pumpkin Mousse with Salted Caramel, Amoretti Cookie and Whipped Cream. 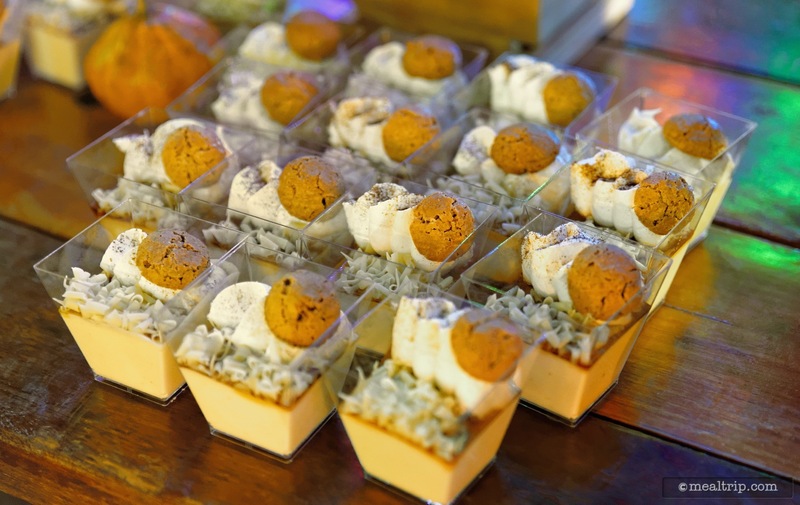 A close-up of the White Chocolate Pumpkin Mousse station. 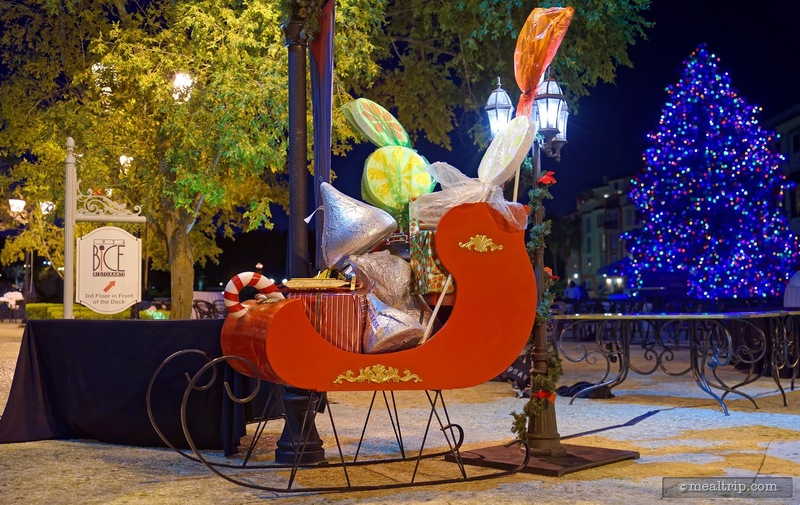 There were only a few nods to the season dotting the landscape at the 2015 Holiday Harbor Nights, one of which, was this life sized sleigh filled with prop candy. 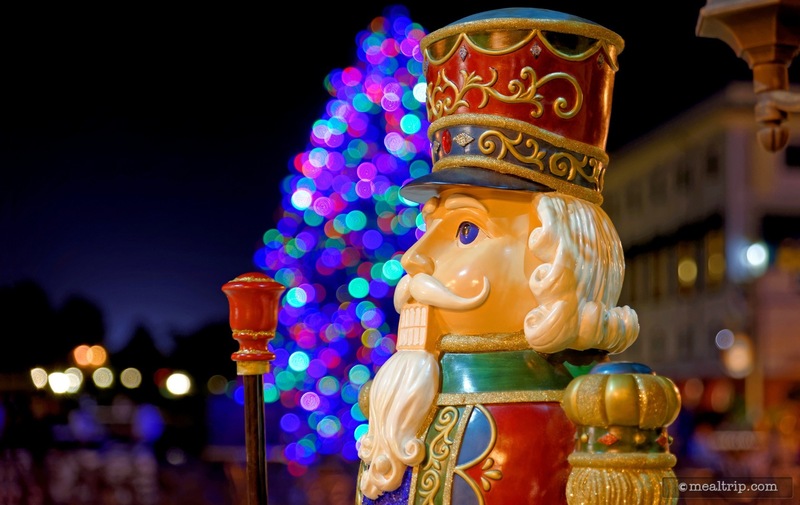 Another of the decor items at the 2015 Holiday Harbor Nights event was this full sized nutcracker, perfect for taking holiday photos with! 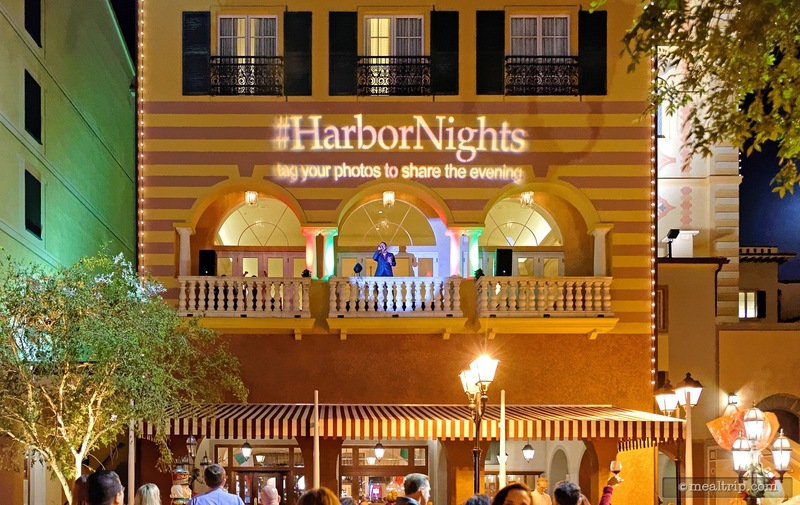 This shot was taken close to the water, looking straight at the Harbor Nights event entrance and the opera balcony. The VIP Seating area is loosely protected by a line of planters and affords pretty good views of everything going on in the main piazza. It is a little hard to see the opera singers from here, but that would be about the only thing not visible from the VIP seats. There are larger VIP group tables available at the end of the reserved seating area. What are the chances the moon would line up with the tree like that? Very cool tree topper at Holiday Harbor Nights! 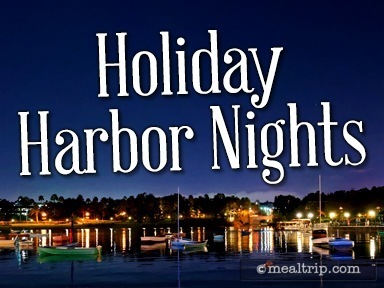 Goodnight Holiday Harbor Nights, see you next year!